Inspiration certainly comes in all shapes and sizes, and sometimes it's the smallest packages that make the biggest impact. When I decided to write this year's columns on people who inspire me, this young lady was the first person on my list. She has a heart of gold, and kindness and compassion that will certainly change the world. I met Kamryn Kiper many years ago as her babysitter. In my junior high and high school days, I babysat for her older siblings, Kaylyn and Kyle. Since I was away at college when Kamryn was little, I only had a few chances to babysit for her, but I've known her family for as long as I can remember. 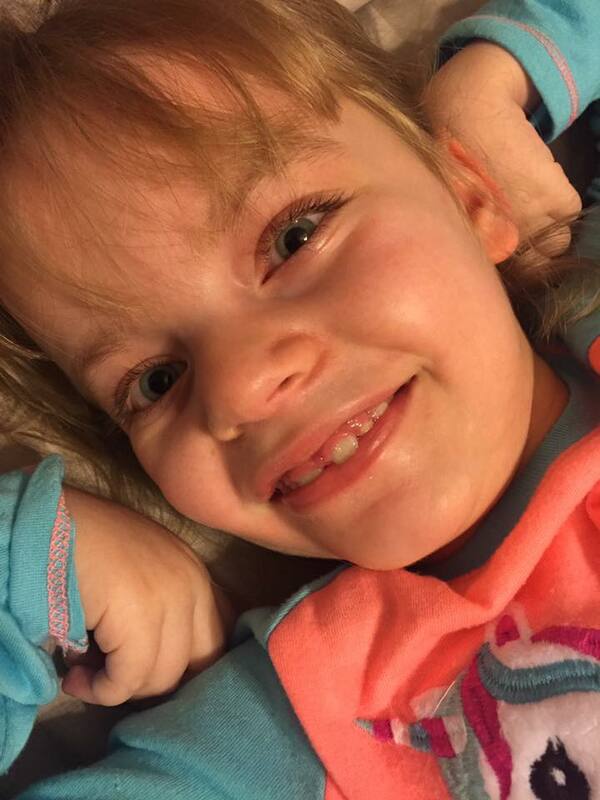 Shortly after Grace was diagnosed with INAD, Kamryn came up to the newspaper office one paper night with her grandpa (Ron Deabenderfer), when he still made obituary and fire calls for us. She shyly walked back to my desk with an envelope full of money, that she had collected at one of her brother's sporting events. 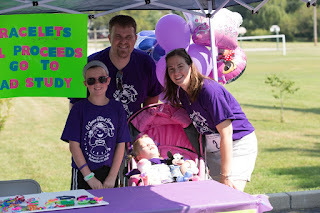 Kamryn made a bunch of the rubber band bracelets and accepted donations for INAD research. Although Kamryn is now 13-years-old and a seventh grader, she was just in fifth grade when she and two friends (Maddi and Layne Ruppert) started this endeavor. That first night, she brought in over $100 for research at Washington University in St. Louis, MO, as well as special ones just for Grace. Throughout that year, Kamryn would stop by the paper on Sunday nights, either with her grandpa or her older sister, and bring an envelope back by my desk with the money she had raised. One day, she had two envelopes, one with money for research and another with money for something we could use to meet Grace's needs. Kamryn had tables of her gracelets in front of her house at Old Settlers and at the first Grace Race, and even made her own business cards. 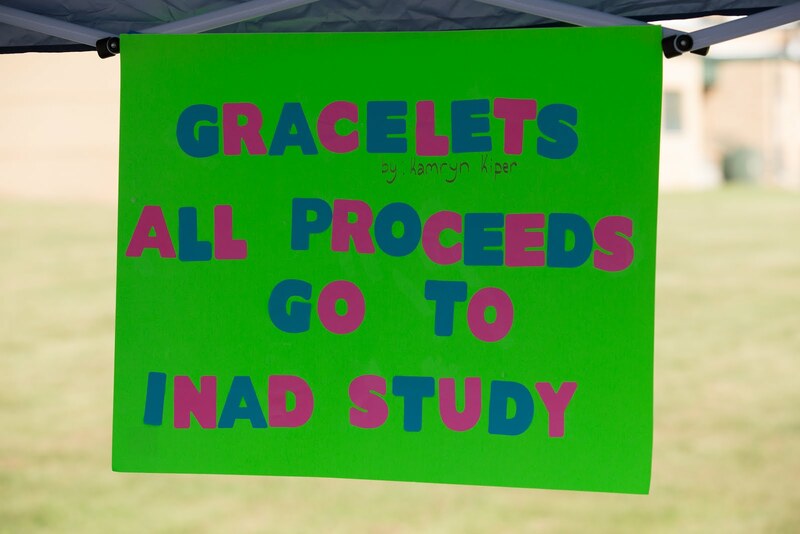 She ended up raising more than $1,000 for INAD research through her project. And we were so blown away. Not just by the amount she raised, but by the spirit in which she gave it. It would have been easy for a ten-year-old to sell bracelets and keep that money for the latest toys or technology gadgets. Her $1,000 would have gone a long way to something she could have used for herself. But Kamryn saw a bigger picture, and felt like there was something she could do that would help Grace. And she did it in a big way. Her thoughtfulness remains such an inspiration to me, because it comes from a sheer love of others. If the world we live in had a few more Kamryn Kipers, we'd be unstoppable. There's a scene in the movie "Dumb and Dumber" where Jim Carey's character asking Lauren Holly's character what the realistic chances are that a guy like him ends up with a girl like her. After some hemming and hawing, Mary Swanson (Holly's character) gives Lloyd Christmas (Carey's character) the devastating news. The heartbroken Lloyd asks how not good. "You mean, not good like one out of a hundred?" Again devastation. "I'd say more like one out of a million." After a long pause, a smile breaks out across Lloyd's face. "So you're telling me there's a chance. YEAH!" You're probably wondering what this has to do with INAD and our journey. Great question. A couple of months ago, I was Googling "infantile neuroaxonal dystrophy" to see if there were any stories out there about INAD. Most of them I had seen, but one caught my attention. It was a GlobeNewswire press release from a drug company called Retrotope. The headline read "US FDA Grants Orphan Drug Designation for Retrotope’s RT001 in the Treatment of Phospholipase 2G6 (PLA2G6)-Associated Neurodegeneration." I didn't exactly understand what that meant because I speak English, not science. Basically though, what the press release said is that this company was granted orphan drug status for a drug aimed at treating INAD and the gene that causes it (the PLA2G6 gene mentioned in the headline). There was a lot of other information in the release, which made me want to investigate further. What I found was that Retrotope had not only developed this drug, but was doing compassionate use trials with two children with INAD. The company reported that the drug had appeared to "have arrested progression" of the disease and had led to a "re-acquisition of lost development milestones" in one patient that had been using the drug since March 2017. This was in an announcement that a second patient would be added to the compassionate use study to see if the results could be repeated. A lot of things went through Mary and I's heads when we read this. Disbelief, shock, surprise. Ok those are all one thing really, but we did have some other emotions. And we've had a lot more since then. Not long after we found out about the drug, we contacted Retrotope and encouraged other families to do so. We had a great conversation with the CEO of the company, the acting Chief Medical Officer and others involved with the study and the company, who is hoping to start clinical trials in the near future. While we know that this drug isn't a cure for INAD (we feel that Dr. Kotzbauer's research into gene therapy at Washingon University has that potential), Retrotope was enthusiastic about the results that their drug produced. And we are enthusiastic too. 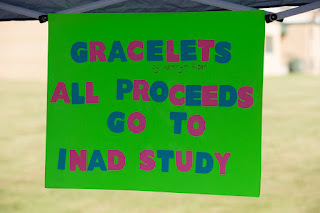 We hope and pray that the drug can slow down INAD and give Grace some of her skills back someday, if she is fortunate enough to be involved in the clinical study. Even if Grace isn't part of the clinical study, we are still enthusiastic. This study means that things are happening in regards to curing and treating this awful disease. Even if it just slows down the symptoms, it will mean huge things for children who are diagnosed with INAD and maybe buy them precious time until we can find a cure. We're not telling you that Grace is ok and that this drug, or something else, is going to cure her. But we are telling you… there's a chance. I think there has always been a bit of a connection between Grace and the Hillsboro girls basketball team, even before she was diagnosed with infantile neuroaxonal dystrophy. In my head I probably envisioned her out there on the court someday, although if she would have inherited my athletic ability, on the bench may have been more likely. 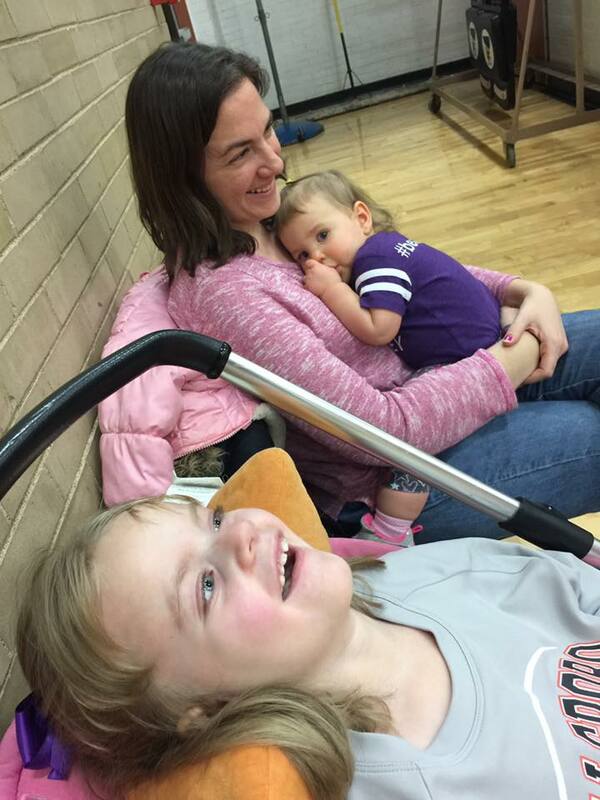 Regardless of my motives, we took Grace to quite a few games when she was little, including a regional game in Greenville that she wandered up and down the bleachers probably 50 times. We got an amazing picture of her holding on to Mary's fingers, sporting a orange Hiltopper shirt and a huge smile. The connection has continued to grow as our journey with INAD has gone on. The team was one of the first ones to embrace us and make us special. Not long after Grace was diagnosed, one of our friends from church, Peggy Cooper, asked if Mary and I were planning on bringing Grace to senior night. We said we were, but in true Herschelman fashion, we were late. Little did we know that the team had planned to make Grace an honorary Lady Hiltopper and sported purple Gracelets, a huge deal considering they were playing purple-clad Litchfield. 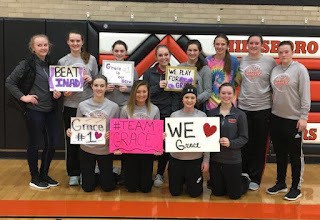 The team made us feel like Grace was truly part of the Lady Hiltoppers. The Lady Toppers made signs for their Grace night game! We still feel that way. Each group has been special and each has taken time to make sure that Grace felt like part of the Topper family. Even though Grace has lost some of her skills, she still seems to really enjoy the games. She's always liked the noise and the people, especially the people that come over and talk to her. This year though, was a little different. We were supposed to go when Hillsboro played Litchfield again this year, but for the first time that we could remember, we had to cancel. The Lady Toppers signed a shirt for Grace. Grace came down with a slight fever and we thought it would be better if she stayed home that night. Coach Bret Tuetken was super understanding and I promised the team that Grace would be back before the end of the season. Still, it was a hard night. Not only that we missed an opportunity to give Grace another experience, but because we never know whether Grace's next illness is going to lead to another hospital stay for pneumonia. It's happened once and even though it wasn't a terrible experience, it's horrifying to Mary and I. 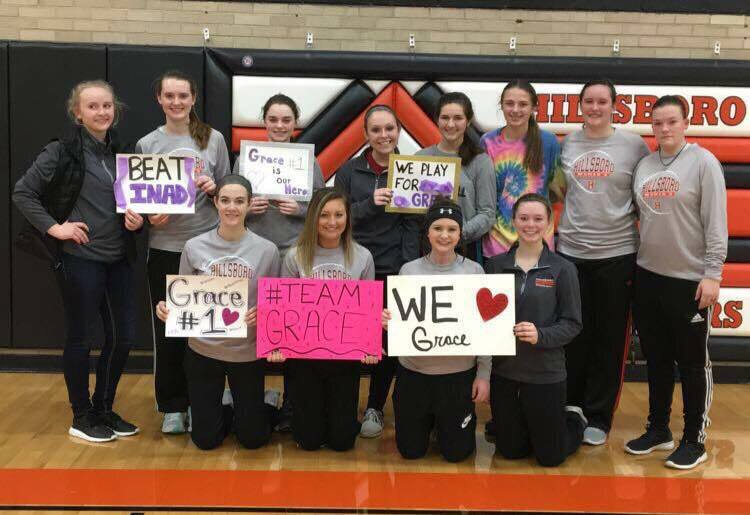 One of the things that helped us though was that the Hillsboro girls took a picture with the signs they made for Grace and shared it with us on Twitter. 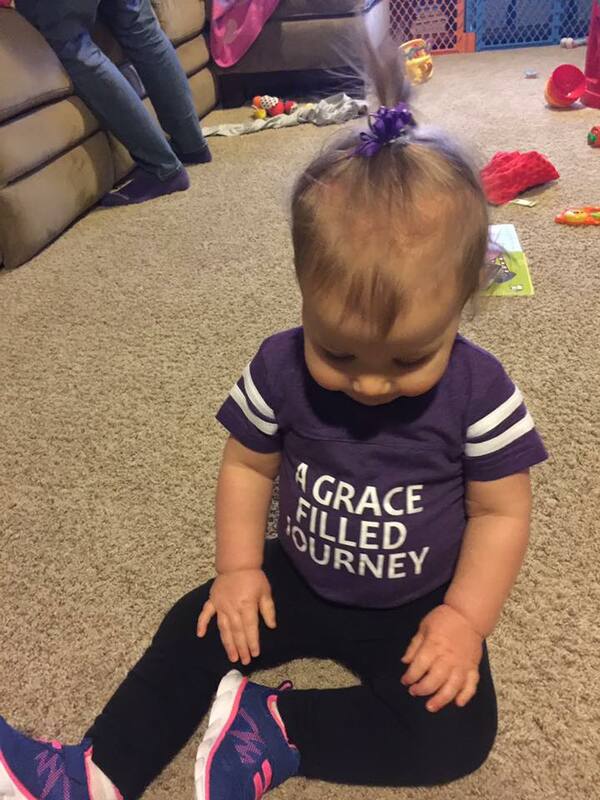 Charley loves to show support for our Grace-Filled Journey. Fortunately, Grace's fever went away and hasn't been back for more than a week now. She still has a bit of a cough, but she's better and Thursday, we got to make more memories with the Lady Toppers. We were late, as usual, but we still got to see three quarters of a magnificent game against Nokomis, who has also shown us a lot of love on our journey. 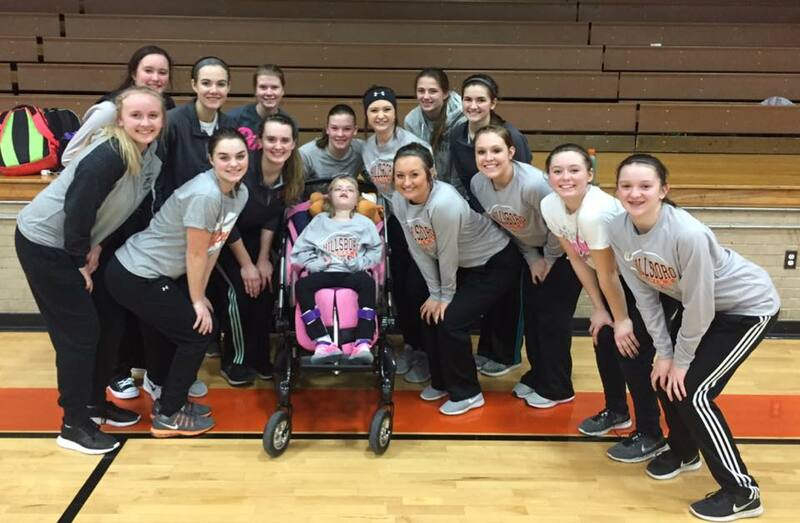 After the game, we went around and thanked some of the players in person and were about to leave when one of the players, Kylie Meier, asked if the team could take a picture with Grace. While a bunch of the players were nearby, several came sprinting over to make sure they were in on the moment. 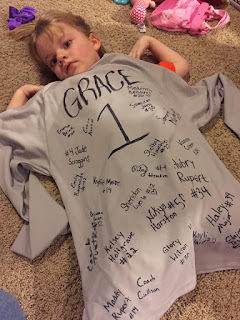 They had given Grace a signed practice shirt, which she wore that night, but the photo of these players with our little girl is one of the most meaningful keepsakes we could have received. Hanging with my favorite girls at the game! We always feel fortunate that the players take time out of what they are doing to talk to Grace and make her feel special. At a certain point, I think Mary and I thought that the newness would wear off, for lack of better words, and that the teams would not necessarily forget about Grace, but wouldn't embrace our family as much. That hasn't been the case. The support from our community has grown stronger and stronger. No matter what happens, we know that Grace will always be a Lady Hiltopper, even if she never puts on the uniform. And the Lady Hiltoppers, past present and future, will always be a part of Team Grace.